Six days at the hospital means it’s time for Raspberry Ice Popsicle Cool Treats! I’m in Minnesota secretly looking forward to a major snow storm later this week while I’m helping to care for my mom after her Kidney was removed. So, now it’s Wednesday and you know what that means… I’m over at the Paper Craft Crew for the Weekly Challenge! Come on over and check out this weeks sketch as well as the Design Team submissions. The challenge starts today and ends on Tuesday, February 28th at 1:30 PM EST. As I write this, I’m totally exhausted and my computer is down to 23% so it is going to be short and quick! I’m tired! The past week has been a whirlwind. On February 14th, I was leaving my husband and son heading to Minnesota as my mom was preparing for Kidney surgery. This past Thursday she had surgery to remove her right kidney due to cancer but we also had additional news of a small spot of cancer on a lung. While I feel I’ve been doing well, it has been exhausting both physically and emotionally. The Friday after her surgery was extremely exhausting as there were lots of Doctors visiting, and technicians coming in for various blood draws or tests. In a short period of time she developed an infection, spiked a fever and White Blood Cell was up as well as Hemoglobin dropping. Before the night ended, she would have a blood transfusion. It was scary but amazing to especially watch the nurses she had keeping an eye on her. The nurses on Friday were phenomenal… Actually, there was really only one nurse we weren’t thrilled with and we really liked the CNA’s that were checking on her. Thick Whisper White card base with a Pool Party and Whisper White base layer. Top layer features the In Color Designer Series Paper Stack using Watermelon Wonder. I stamped the Raspberry Slush Popsicles using the Cool Treats Stamp Set then die cut them with the coordinating dies. In the upper left corner is the Cool Treats designer Washi Tape with a button tied with Crushed Curry Bakers Twine. The Sweet is stamped with Pool Party then die cut using the Layering Ovals Framelits. Layer is Pool Party card stock. Finishing Touch are the Enamel Shapes. To purchase the products used on this beautiful project, visit my 24/7 Stampin’ Up! store by clicking HERE! For your convenience, I’ve also included a supply list at the end of this blog post – just click on any of the items to be taken directly to my 24/7 Stampin’ Up! store to purchase the products used. I also invite you to pin my creations to Pinterest and to share your thoughts or questions by leaving me a comment. I love hearing from all my readers – word of mouth is one of the greatest forms of flattery. Don’t forget to follow me on Pinterest! I’m actively building my Stampin’ Up! team and invite you to join the tunny Craftin’ Crew! 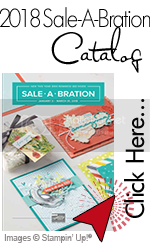 We are a group that loves having fun, creating and doing what we love with Paper Crafting – we are spread out across the United States and around the globe (Military Downline). Some of us are Business Demo’s and some are Hobby Demo’s… I love having both on my team. Now is an especially GREAT time to join. Feel free to email me if you have questions or click HERE to join my team today!